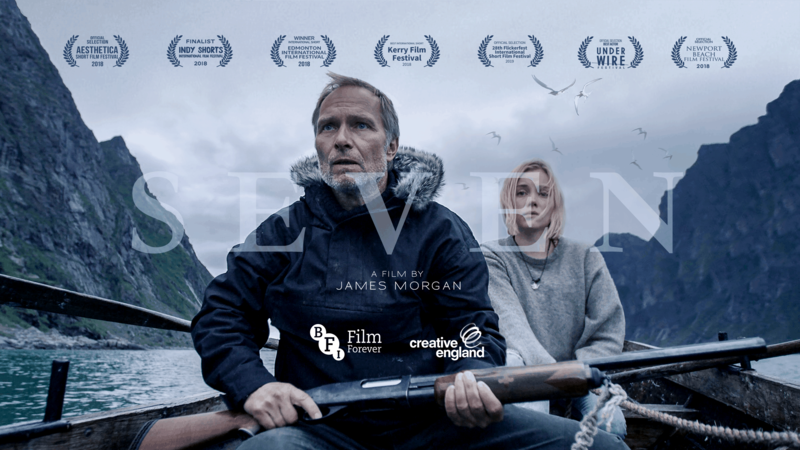 Described by Emmanuel Lubezki (Birdman, The Revenant) as “beautiful and very moving”, SEVEN tells the story of a young girl from a remote Arctic village who must decide the fate of an outsider who has committed a terrible crime. The choice she makes will change her life and determine the future of her community. SEVEN occupies the liminal space where wilderness and culture, tradition and modernity collide. The film unfolds in a surreal and stunning Arctic landscape of rearing cliffs and vast seascapes at the edge of civilisation. Dagny Backer Johnsen began her acting career at the National Theatre of Bergen, Norway in 2005 and has since participated in a number of productions at the National Theatre and Vestlandske Teatersenter. On screen, she is known for her role in History Channel’s Vikings, and has played leading roles in a handful of shorts. She was the lead in the Canadian feature film Violent, which premiered in 2014, and earned her a Best Actress nomination from the Vancouver Critics Circle. In 2016, she was one of the featured actors to attend the Actors Studio at Berlinale Talents during the Berlinale film festival. Born in 1968 in Gibraltar, Nicholas studied acting at the Guildhall School of Music & Drama in London. His screen credits include Game of Thrones, Shakespeare in Love and Jonathan Creek. He has played leading and major supporting roles for many British stage productions including for the Royal Shakespeare Company, the Almeida Theatre, and the Royal National Theatre. Winner of the BBC Radio Carleton Hobbs award in 1993, he is regularly heard in BBC Radio drama productions. He features prominently in the world of video games, voicing Garrett Hawke in Bioware’s Dragon Age 2, Reyes Vidal in Mass Effect: Andromeda and Ruben Bosman in Ubisoft’s Steep. Other titles include Battlefield One, Assassin’s Creed, Star Wars: The Old Republic and many more. Trond’s acting career spans nearly 30 years and includes a wealth of screen, stage and voice roles in his native Norway. He is perhaps best known for his voice work as Aladdin in the hugely popular Disney film - other voice credits include Shang in Mulan, Beymax in Big Hero Six and Spongebob Squarepants. Trond’s TV credits include the popular Norwegian sitcom Holms, the soap opera Hotel Caesar and several other series including Occupied and Volkyrien. He also starred in the movie Detective. On stage he has played Tony in West Side Story, Anthony in Sweeney Todd, Marius in Les Miserables, Brannigan in Guys and Dolls and Colonel Pickering in My Fair Lady amongst many others. James Morgan is an award-winning film director and photographer. His work explores our changing relationship with the natural world, often featuring individuals who walk the borderline between wilderness and civilisation. Alongside commercial work for Facebook, Unilever, Apple, Canada Goose and others, James has produced and directed award winning documentaries for Al Jazeera, BBC, Netflix and National Geographic. Johnny Langenheim has produced award-winning broadcast and commercial content for global brands including Nat Geo, Facebook, Netflix, Universal Records, The Guardian and WWF. His background in journalism, including a 10 year stint in Southeast Asia, has afforded him access to unique subjects, cultures and communities, while honing a keenly developed instinct for story. His work often explores the liminal space where communities on the margins confront global changes. Emily is a London-based producer with a background in magazine journalism and an academic grounding in art history (University of Oxford) and social anthropology (London School of Economics). She made her transition into media production at the BBC before working with JMF on a range of documentaries and commercial projects. Emily is widely travelled, with experience working in almost every environment from the Amazon to the Arctic Circle, and has produced content on a diverse range of topics from art and space travel to the environment.